The passage of the 18th Amendment in 1919 — prohibiting the sale of alcohol in the United States — failed to sober up the country. It merely drove its unquenchable thirst underground. Prohibition came about because of an extraordinary union of disparate groups — religious folks, racists, progressives, nativists — all possessing different motivations for banning booze. It was a movement decades in the making. 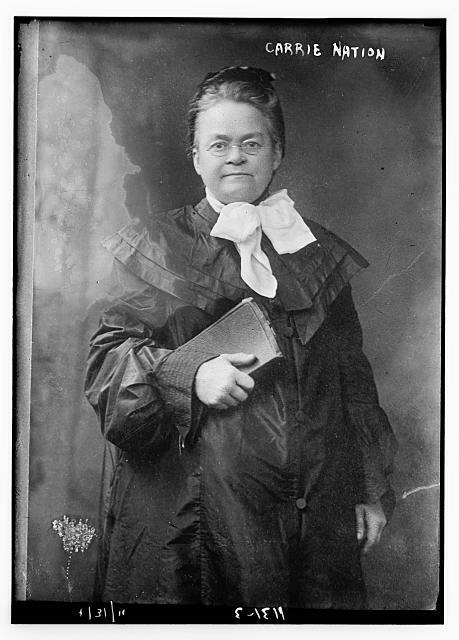 One of the most radical superstars of the movement was Carrie Nation, that hatchet-wielding temperance terror whose unorthodox and non-peaceful displays of protest made her a national celebrity. Literally taking directives from God, Nation battle-axed her way through small Midwestern towns, protesting the sale of liquor with violent force, chopping at bartops, bottles and furniture with her signature hatchet, accompanied by a righteous choir of church ladies belting hymns while dodging splinters. 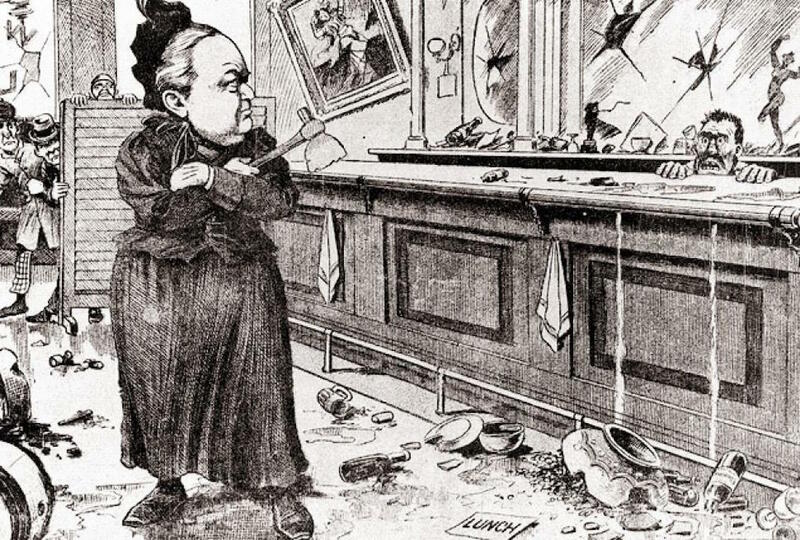 Nation was regularly arrested and fined, but under the cover of doing God’s duty — and riding a swell of anti-liquor sentiment — she managed to continue her vicious tirade across the country, becoming the temperance movement’s most colorful star by the turn of the century. She even sold minature replicas of her well-known weapon to fund her cross-country adventures. 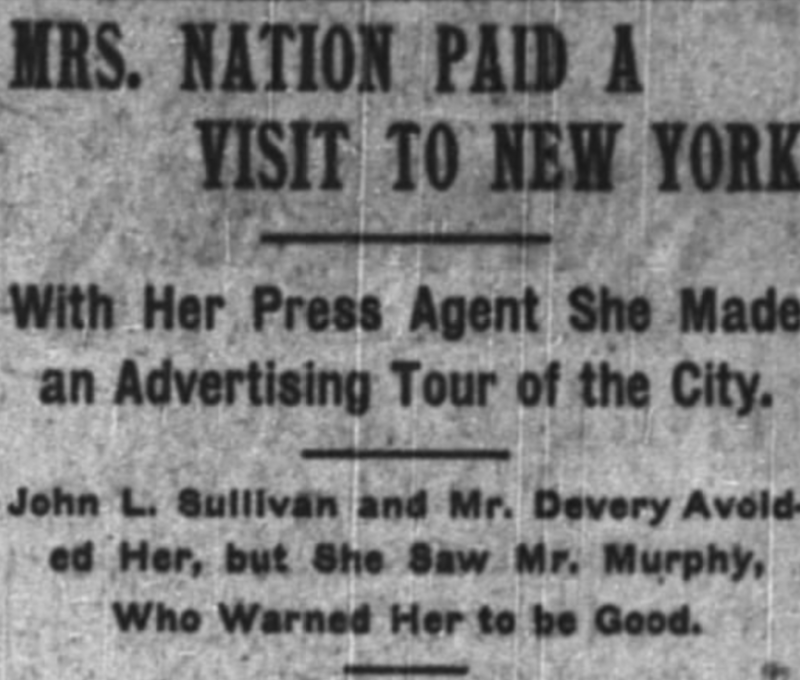 Nation’s reputation had obviously preceded her when she arrived in New York on August 28, 1901. Law enforcement and nervous saloon owners braced for the worst. After freshening up in a suite of rooms arranged for her at the Victoria Hotel on 27th Street and Broadway, Mrs. Nation headed down to police headquarters on Mulberry Street to address the general drunkenness conditions of the city directly with police commissioner Michael Murphy. Their exchange was not pleasant. Nation, called ‘the feminine devastation’ in one press report, demanded to know why the city kept saloons open on Sunday. Murphy replied that it was legal to do so. She bitterly lectured back with a Bible verse; New York “is full of hell holes and murder shops,” she cried. “Don’t quote scripture at me, Madame. Go back to Kansas and get that off on your husband,” the commissioner replied. After a few more volatile exchanges, Nation was forcefully removed from police headquarters. (Certainly, this result was one she had intended. Her press agent was waiting outside with a throng of curious onlookers.) Nation next decided to harangue the mayor and prepared to visit City Hall. 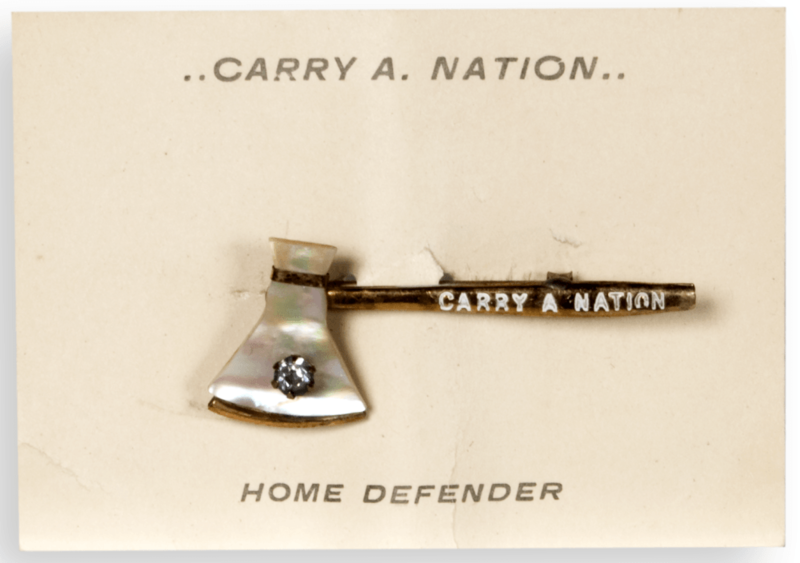 When message was sent that the mayor didn’t care to meet with the fiery reformer, Nation decided to do what came most naturally — she headed for a bar, hatchet in hand. The unfortunate establishment in her crosshairs was that owned by famed boxer John L. Sullivan, himself a celebrity of some flamboyance. Having spent the 1880s as one of America’s most legendary bare-knuckle fighters, he was famously brought down (in a gloved match) by ‘Gentleman’ Jim Corbett in 1892. 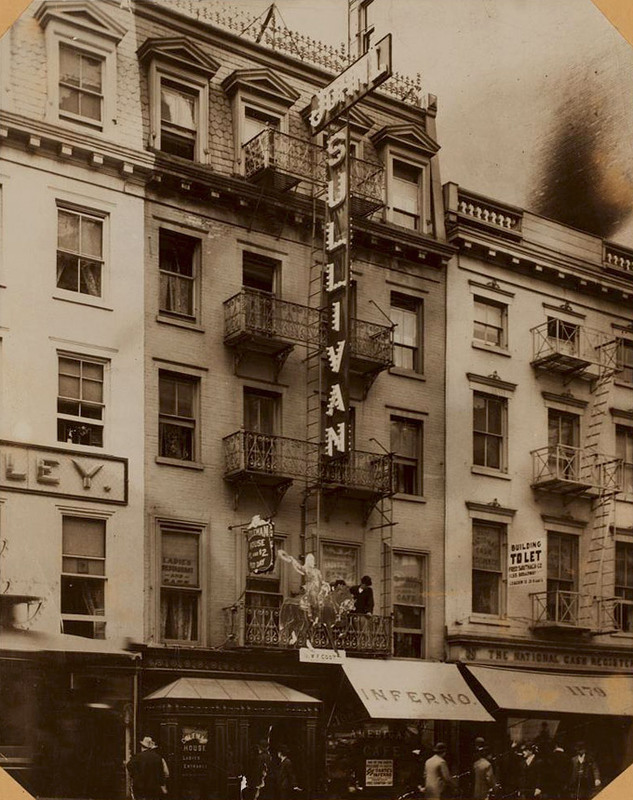 Like many boxing stars before him, Sullivan ended up in New York as a saloon owner, at 1177 Broadway, between 27th and 28th streets (at right). And right near the hotel hosting Carrie Nation! The mighty athlete was certainly fearful of his property being chopped to ribbons. This wasn’t some Bowery dive bar, after all. But while the authorities were certainly no friends of Nation, she was a very popular symbol among New York’s temperance supporters. Arresting such a known figure would have actually played into Nation’s intentions. Best to wait out the storm, I suppose. By that afternoon, Nation has left town via Grand Central, off to more wily stunts in the Midwest. Drinkers and cops alike raised a toast in relief. Police commissioner Murphy later said of Nation: “She is an old barge, a real old nag. She has a bad, vicious face. I guess there’s method in her madness,” implying her crusades were more for fame than Christian salvation. BY THE WAY: A few summers ago I took a trip back to Ozarks (where I’m originally from) and spent an evening in marvelous Eureka Springs, Arkansas. 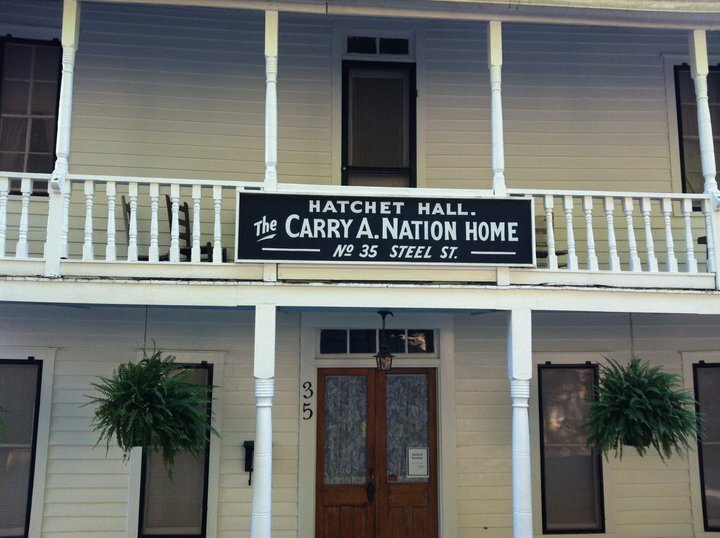 Carrie Nation spent her final years here, appropriately opening a boardinghouse for widows and proper ladies called Hatchet Hall. The Hall is still preserved near the center of town (pictured below) and across from a boarded-up water spring that was also named in Nation’s honor. 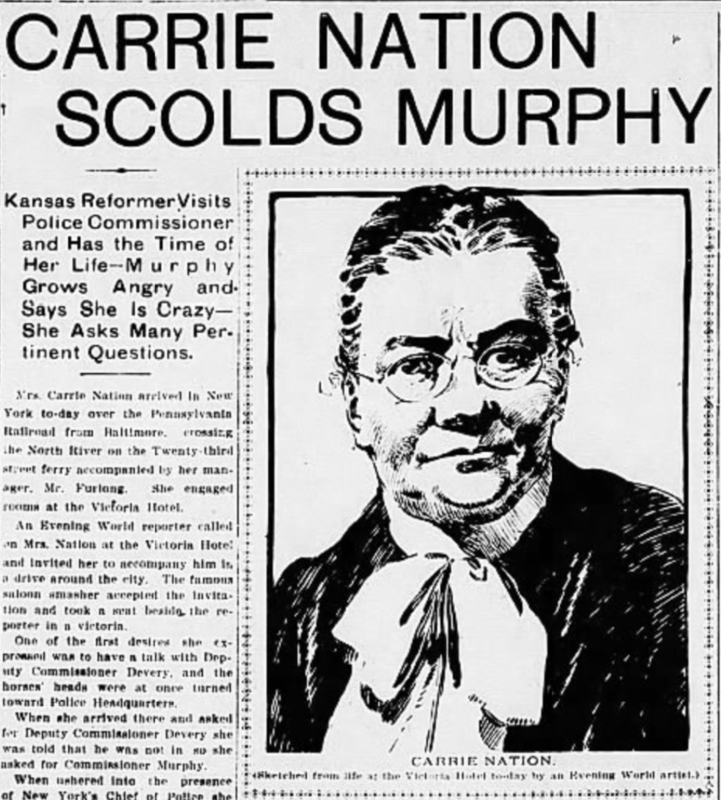 She collapsed during heated speech right up the road from Hatchet Hall in 1911 and died shortly thereafter in a Kansas hospital.